Election season can be the worst time to be a radical. Which is to say, it’s tough to be someone who believes that fundamental systemic change is needed when the parties that have our democratic imagination in a sleeper hold are sucking the air out of the living rooms of the nation pitching their tweaks to the status quo. There’s not much to do for those who believe in dealing with environmental destruction, colonial pillage, alienation and inequality: the fundamental features of capitalism. If you see radicals out and about during election season, they’re either eating ballots or sporting a cynical grin as they wrangle volunteers at a temporary NDP campaign office for some fast cash. If they’re not decrying the pitifully limited range of debate, they’re probably just crying. Elections can be a unique opportunity to bring up issues and assert some “radical” influence. Here’s an example. We didn’t back a candidate; our only goal was to unseat Pettigrew. We fashioned some posters featuring Pettigrew’s image with the words “WANTED FOR CRIMES AGAINST HUMANITY IN HAITI”. It wasn’t subtle, but it had the virtue of being true, and the Minister had declined several opportunities to change course. We mustered a crew of a dozen or so activists and saturated the riding, handing out over 12,000 flyers at metro stops and on the street. We put up 2,000 posters in the riding and organized a few actions. Our message was hard to avoid. We even got a little overzealous, and postered over some of Pettigrew’s election signs — a federal offense. In one instance, Pettigrew’s campaign manager saw two of us and called the police. But even that hurt the Foreign Minister. We sent out a press release concerning our arrest, and were rewarded with our first coverage in two years of campaigning in the crime-obsessed tabloid paper, Journal de Montreal. A photo of our poster appeared on page five. So thoroughly had we saturated the riding with our propaganda, that in the last week of the campaign, we got cocky and tried to go after Denis Coderre (who also helped the coup d’etat) in a riding further to the north. It was exhilarating, even if the victory was ultimately overshadowed by a Conservative minority government. It’s disappointing, but not surprising, that there have been few campaigns since that have followed anything like the “Pettigrew model”. Today, much of the “anyone but Harper” campaigning that’s happening suffers from lowest-common denominator political messaging designed to tell people what the messengers believe people want to hear. We believe that more bold messaging and an aggressive tactical approach can both change the terms of the debate and achieve electoral outcomes. In fact, we think it’s more likely to succeed in defeating sitting Conservative MPs in close ridings. A few Haitians and solidarity activists pulled it off with minimal resources, but it’s important to note the factors that led to success in the Pettigrew case. The riding, Papineau, is small, low income, and has a significant immigrant population, including many people of Haitian descent. It also has a number of metro stops and a vibrant commercial district, which means lots of foot traffic: high visibility for posters and easy flyering. 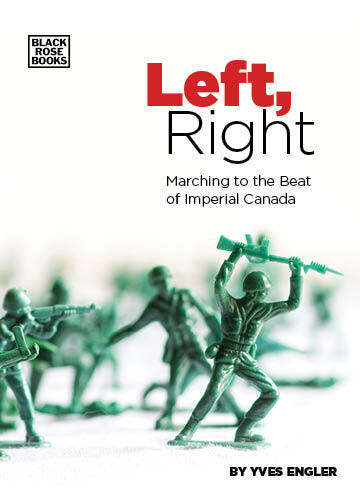 We had a small group of highly-motivated people who agreed on the basics: that Canada orchestrated a brutal coup d’etat, and Pettigrew must go. None of us had a problem with members of the group risking tickets or arrest. Because of these factors, we were able to make our message nearly unavoidable to residents of Papineau. How many people got educated about the coup d’etat, and became convinced? It’s hard to know. We can imagine that the saturation provoked a few dinner table conversations. It probably shaped a lot more: it’s harder to declare your support for someone when their face is on wanted posters pasted on every street corner. Our campaign coincided with a wave of revelations about Liberal scandals, which probably demoralized constituencies that would normally turn out. We helped make the decision to stay home a little easier. But we don’t want to undersell the accomplishment either. A Haitian woman running for the Bloc Quebecois beat a well-financed star candidate and high-ranking cabinet minister in what was historically a Liberal stronghold (it’s now Justin Trudeau’s riding). We think that’s enough to be able say that this kind of electoral intervention is underutilized. But for mostly obvious reasons, groups like LeadNow, Council of Canadians and Unifor are unlikely to undertake this kind of campaigning. So it’s up to small, independent groups of motivated and organized people who want to set the agenda.